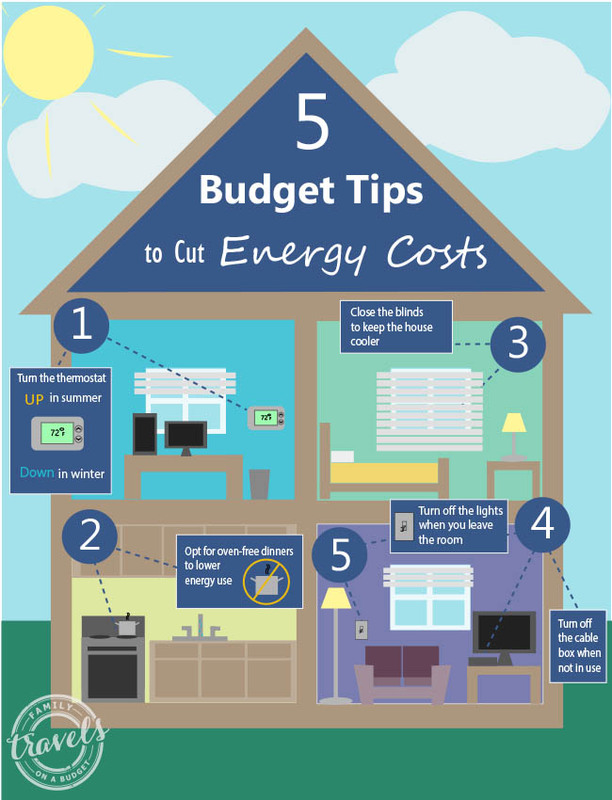 Home » budget » Budget tips to cut energy costs! Around our house, one thing we ask is, “Would you rather spend money on this or vacation?” Most of the time vacation wins! With this summer’s record setting temperatures in North Carolina, we’ve had to work hard to keep our electric bills in check. It’s worth it though. I don’t want to dip into my vacation budget to pay the electric bill! (Not to mention, it’s good for the environment too!) If you want to save money on your electric bill, whether for vacation or something else, maybe these budget tips will help you too! 1. Set the thermostat higher in summer and lower in winter. The electric heat pump is a popular heating/cooling system in the southeast, but it’s got limits. We learned in February that it doesn’t heat well when the air temperature dips below 32º for days at a time. We set the heat at 60º to cut the strain on our heating system. Guess what! It doesn’t cool well when the temperature soars in the summer either. We’re in the midst of a 2-week long 95+º run and the a/c unit never stops running. It turns out that heat pumps are designed to run best when the indoor temperature is within 20º of the outdoor temperature. SO…. it’s a bit warm at my house, but we’ve set the thermostat for 78º during the day. We’re dressing in shorts and drinking lots of ice water to stay comfortable. And… with this one budget tip, we’re saving tons on our electric bill! 2. Opt for oven free dinners. Instead of running the oven during the summer, which costs lots of money to run AND heats up the house forcing the a/c unit to work even harder, we switched to sandwiches, simple stove-top meals and grilling outdoors. We also use our crock pot a lot. Right now, I have a homemade marinara with sausage meatballs simmering in my crockpot. It’s a low energy cooking source and dinner will taste great! 3. Close the blinds. We’ve got lots of windows in our house — because I love daylight! But, the sun heats the house (just like it heats your car). Close the blinds and curtains to keep the house from overheating. It really helps. 4. Turn off the cable box overnight! The #1 energy zapper in your house is that DVR machine. Yes, it’s convenient to record favorite shows, but running the DVR non-stop is a huge waste of money. Hook the DVR, TV and your surround sound (or whatever electronics you use) up to a surge protector and shut it off before going to bed. The energy saved overnight is money in your pocket. 5. Turn off lights when you leave the room. Growing up, my dad always hounded us to shut off the lights when we left the room. My kids hear the same thing — and they’re self-disciplined about it. They even turn off lights behind their friends, which I find really cute. When they were little, we taught our kids that dust bunnies can see better in the dark. They fell for it, and now it’s easy. Right now, we’re saving for a vacation to Mackinac Island (#1 on my bucket list)! Every time that electric bill comes and it’s lower than our budget, we’re putting real dollars into the vacation fund. I’d much rather do that then give the money to the energy company! Wouldn’t you? If you have an energy saving tip, I’d sure love to hear it! Share it here, or join the discussion over at Facebook! I will never turn down advice when it comes to cutting costs. I really liked these tips, especially the first since I have an electric heat pump. I didn’t realize that they don’t perform very well when the air temperature dips below 32 degrees for days at a time. I can definitely see then why you would set the thermostat at 60 degrees. Thanks for sharing!